September 11th Families for Peaceful Tomorrows Rule of Law campaign mobilizes and amplifies the voices of 9/11 family members who support closing the prison at Guantanamo Bay, restoring the rule of law, and ending indefinite detention and other violations of human rights that have become an enduring legacy of the U.S. “War on Terror.” Our goal for this initiative has been to strengthen the reasonable voices of 9/11 family members who support the rule of law in all aspects of dealing with the perpetrators and accused perpetrators of the 9/11 attacks. This includes the decision to conduct federal versus military trials, to close Guantanamo, to end indefinite detention, to end the military commissions, and related issues. I stand here today as a representative of September 11th Families for Peaceful Tomorrows. Yes, that’s right. There are 9-11 families who want Guantanamo closed. But more importantly, I’m here to represent the dedication and passion of one of our founding members, Rita Lasar. In a huge loss to this movement to close Gitmo, Rita died this past Sunday at the wonderful old age of 85. I invoke Rita’s spirit here today because Rita’s life and work so personified our collective efforts. Rita was at this march and rally several times over the years. Rita traveled to Guantanamo, and made no secret of her opinion that Guantanamo should be closed, shuttered forever, and the 9-11 trial should be moved into federal court. She had the ear of not only the press, but of both the defense teams and the prosecution. Rita had zero tolerance for torture, in all its various pseudonyms and justifications, and was rightly concerned that the torture of Guantanamo detainees might be hidden from public view forever. We have to think that she would be pleased at Judge Pohl’s decision yesterday ordering the Pentagon to preserve its copy of the so-called Senate Torture Report … a first step towards transparency. To honor Rita’s memory, and the memory of the nearly 3000 people murdered on September 11th, Peaceful Tomorrows recommits to its search for justice, for truth, for accountability. We will persist until Guantanamo is closed; the conspirators of mass murder are tried and convicted; and this beloved nation of ours rejects fear as a motivating call to action, instead once again confirming the rule of law as the true path to justice. See more in our new campaign section on Guantanamo. Starting in 2002, September 11th Families for Peaceful Tomorrows helped lead opposition to the war in Iraq. After the U.S. invaded Iraq, we looked for ways to remain supportive of the Iraqi people. As part of our solidarity efforts, we have helped to publicize the campaigns of the Iraqi nonviolence network, La’Onf, to let people know that Iraqi citizens have a vision for their country that includes peaceful relations among different religious and ethnic groups, equal rights for women, and human rights and freedom for all. We are also a member of the Iraqi Civil Society Solidarity Initiative, a collaboration between Iraqi and international NGOs to effect change that supports justice and democracy in Iraq. In January 2002 four people who would soon become founding members of Peaceful Tomorrows traveled to Afghanistan to witness the consequences of U.S. military intervention, to express concern about the devastation of civilian casualties and to draw attention to the prospect that this war would increase terrorist recruitment. Peaceful Tomorrows members have continued to travel to Afghanistan, to speak out against war and violence in Afghanistan, and to build friendship and collaboration with civil society organizations in Afghanistan and elsewhere in support of peace for the women, men and children of Afghanistan. Peaceful Tomorrows works for an end to foreign military action and foreign military funding in Afghanistan, for a ceasefire and negotiated path forward, and for nonviolent and inclusive rebuilding and healing for Afghan society. On Monday June 24, twenty-five members and religious leaders of the Metrowest interfaith community met with Wilnelia Rivera, the External Affairs Director for the Patrick administration to discuss the slight that the Islamic community felt from the governor’s office after the Boston Marathon Bombing. Other leaders present included Susan Thel of the Framingham Quakers, Michael Furstberg of the Workmen’s Circle, Dr. Asif Razvi of the ICB in Wayland, Mr. Anwar Kasmi, a board member of the I.S.B.C.C., and Shaheen Akhtar, leader of the Wayland interfaith book group. The issue was that the Muslim religious community felt slighted when a secular Muslim leader was selected to participate in the interfaith memorial service attended by President and Mrs. Obama, shortly after the Boston Marathon bombing. Their understanding was that an invitation had originally been extended to Imam Suhaib Webb, and was then rescinded the evening before. 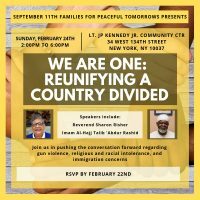 In response to the rise in hate crimes, including recently deadly attacks against innocent Sikh men in the tri-state area, families of those killed in the 9/11 attacks have developed a new bus ad calling for unity and interfaith tolerance that will be posted on New York City public transit. Please join us by helping fundraise and contributing yourself to the campaign. Click to read the Peaceful Tomorrow’s 2016 Media Report. Click to read the 2016 911 Families Annual Media Audit.